If you haven’t already guessed it, I’m a donut fiend. A trip to a new city isn’t complete until I check out their donut scene. While Portland, Austin, Beverly Hills (the now defunct but fabulous Fritelli’s) and San Francisco all have amazing artisinal donuts, I’ve been longing for San Diego to have a donut scene of our own. Mary’s Donuts, Stardust Donut Shop and V.G.’s are all worthwhile donut places but Donut Bar deviates from the pack by being the only shop located downtown and they hand form all their donuts. 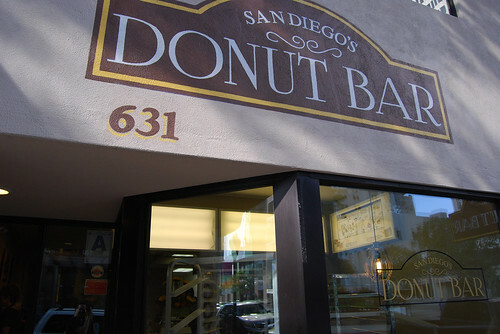 Donut Bar opened their doors on Saturday, March 25 and quickly sold out their inventory to a lot of people’s dismay. (All donuts were specially priced at a dollar each for their grand opening.) By the time we arrived, the chocolate espresso donut was sold out and we only managed to try what few varieties remained. 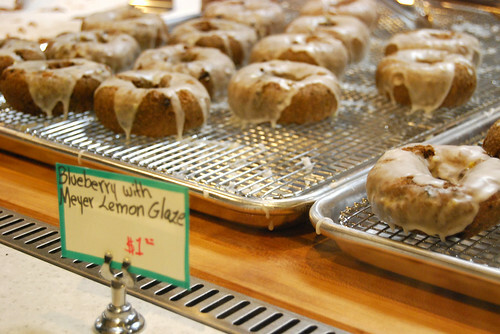 My favorite was the blueberry cake donut with meyer lemon glaze — fresh blueberries with a sweet-but-slightly-tart glaze is a nice contrast to the usual varieties I’m used to. The salted caramel raised donut came in a close second with its lighter than air texture and bites that swing between sweet and salty. By the time they reopened on Monday, they increased their inventory and selection but they still managed to sell out a few varieties before we arrived at 9 a.m. The blueberry cake was unavailable (they plan to rotate their donuts on a daily basis) but they had plenty of other choices. 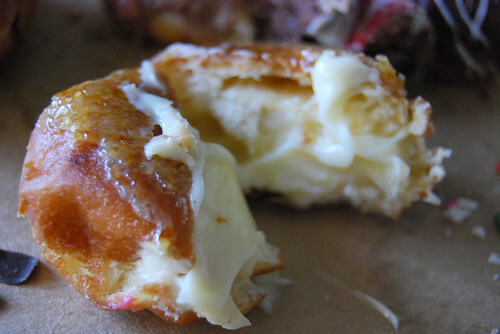 The creme brulee donut was masterful with its crunchy top and custard center. It was well worth the $2 price tag considering each one was hand filled and individually blow-torched. The birthday donut can be overwhelming for those sensitive to sugar and no new ground was broken with the maple bacon donut. I’ve seen a few complaints online about inconsistent sizing but I think that’s an issue that goes hand-in-hand with pastries not machine created. Once Donut Bar gets settled, I’m hoping for great things for this place. 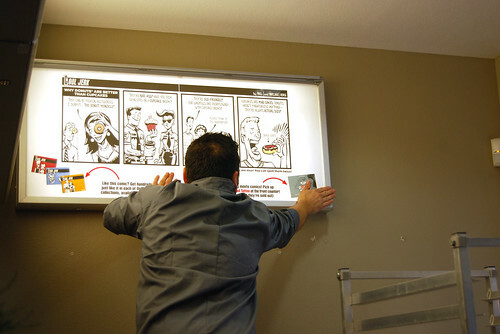 If you happen to be there to check it out for yourself, look for the comic on the wall. It’s a never-published Paul Horn strip. You can even pick up a copy of The Girl with the Donut Tattoo available for sale at the counter (while supplies last). Yay! We will definitely check this place out! Love that they have a strip from your comic there! So cool! I really wanted to go on Saturday, but we ended up not making it. 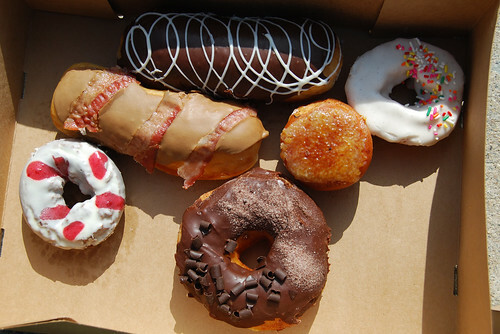 I’m excited to try the donuts though – they look great from your photos! And I still need a copy of your book!! That’s awesome there’s a strip of your comic there! They keep changing their menu around. I may never have the chance to try them all. About time! So very cool about the comic too.